You won’t find this practice on offer at Spirit Rock or any meditation center in a western country where by law death is kept tidily under wraps, corpses whisked away, embalmed or cremated in ultra-private settings. So even if we have been present at the death of a loved one, or have attended an open-casket funeral, we have none of us in this culture sat among the decomposing remains of another human being. If we spend time in nature, we do occasionally come upon a decomposing bird or small animal. Instead of turning away, we could spend some time in contemplation nearby. But why on earth would we want to do this? Not for some maudlin fascination with death, but for acceptance of death as a natural part of the life cycle. The more squeamish we are about it, the more extreme our reaction to the very idea of it, the more likely we need some form of this practice as a way to come into balance. On the other hand, if you are already fascinated by death, are addicted to movies and books that glorify it in some way, then this practice might be a tempering, a reality check. Remember we are just sitting near the decomposing remains, not handling them. We are sitting and noticing our sensations, thoughts and emotions that are activated by this practice. For a milder introduction to this contemplation, the next time you are about to toss a bouquet or dead-head a flower in the garden, pause and spend time with the wilting, browning, drying, crumpling state of the flower. Notice your feelings about the impulse to get rid of anything that is not in the ‘perfect bloom’ of life. Can you sit with it? Can you find beauty in it? What thoughts does sitting with it bring up? What emotions? I remember growing up being horrified to find something moldy in the refrigerator. My mom, the refrigerator keeper, would ask ‘Where do you think penicillin comes from?’ I would come back, ‘But Mom, this is a kitchen, not a pharmacy.’ Eeuuw! Sometimes artists over the centuries have chosen to depict decay — dying flowers, rotting fruit or a well-placed skull — to remind us that all things are transient. Though Western artists, they hit on an Eastern concept and a universal truth. In Theravada Buddhist tradition, impermanence or anicca is one of the Three Marks or Characteristics. 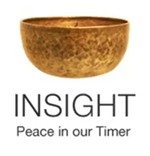 Insights arise through meditative practice that awaken us to the nature of impermanence. If we don’t understand the nature of impermanence, we cling in a way that causes suffering. When we accept impermanence as a natural condition of life, then we are better able to stay present with what is, to value it in this moment, understanding its (and our) temporal nature. We are less likely to take our loved ones for granted, more likely to tell them we love them in this moment rather than putting it off for another day. We are more likely to pause to notice the beauty all around us. Death and decay are not the only records of impermanence. In the time that I have added a mere wrinkle or two, my two granddaughters have doubled in size and exponentially grown in abilities! I understand the desire to ‘catch the moment’ and I admit I am writing long love letters to each of them in just such an attempt. But I am also simply treasuring this time, knowing it is fleeting. Their father, aunt, uncles and cousins — babies who transformed into adults before my eyes — the absolute proof of that? So not just death but life teaches us impermanence. The awareness of impermanence, the record of change and loss that each of us carries, is awakened in us as we age, creating natural wisdom in those willing to see, accept and even embrace the beauty of the cycles of life, including death and decay, that lead ultimately to rebirth. We see that when we come into an awareness of impermanence, it is only grim and depressing if we are clinging to the way we want things to stay. It is our clinging and aversion that causes our suffering — the way we relate to experience rather than the experience itself. The only place to find joy in it is in the present moment. If we live each moment full of loving awareness, then time’s passage loses its bitter bite. We are not trying to change our minds about anything. We are just noticing the natural occurrences of human reactivity. Then we bring ourselves back to an awareness of this moment, through anchoring into the breath or other reliable physical sensation. This weekend I gave a 40-minute presentation to a large group of non-meditating public speakers on ‘Mindfulness for Ease at the Podium.’ If you are interested in finding more ease in public speaking, check out this downloadable recap. It includes a brief video of me giving one of the experiential exercises I did for the presentation. This entry was posted in charnel grounds, death, First Foundation of Mindfulness on November 4, 2012 by Stephanie Noble.